On February 11, On Your Radar filled Rockwood Music Hall Stage 2 with a great lineup. First up was Meg Hutchinson, from Boston, offering some of her quiet, poetic songs, including "When the Lights Aree Down," which you can hear below. Then came folk veterans Ina May Wool and Bev Grant, who have teamed up as the duo Wool & Grant. After performing some of their well-crafted, thought-provoking original songs, they closed with the bawdy Ida Cox blues classic, "Wild Women." Finally, the Boston-based quartet, Darlingside, showed why they're creating a buzz, with their literate songs, gorgeous harmonies, and virtuosic musicianship. "Open Door" is just one example. 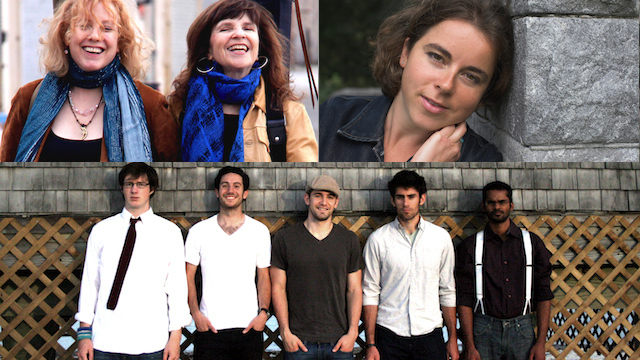 The next On Your Radar is Tuesday, March 11, with the string band Cricket Tell the Weather, the Rhode Island singer-songwriter Mike Laureanno, and The No Fuss and Feathers Road Show (featuring Carolann Solebello, of Red Molly fame, Karyn Oliver, and The Ya Yas).